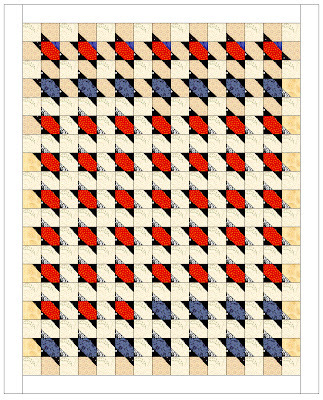 My friend, Randy and I decided to join the quilt block contest. 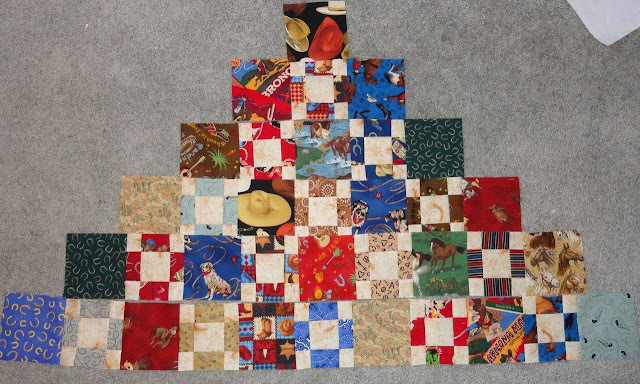 The blocks will be displayed during the Sisters outdoor quilt show and the quilt show instructors will pick their favorites. I don't have any plans on winning, but it will be fun to make a block and join in on the group project. Here's the fabric! Way out of my box!! The rules state you cannot add any fabrics but you do not need to use them all. There's still time to get in on the fun! Block 2 of Beyond the Cherry Tree. 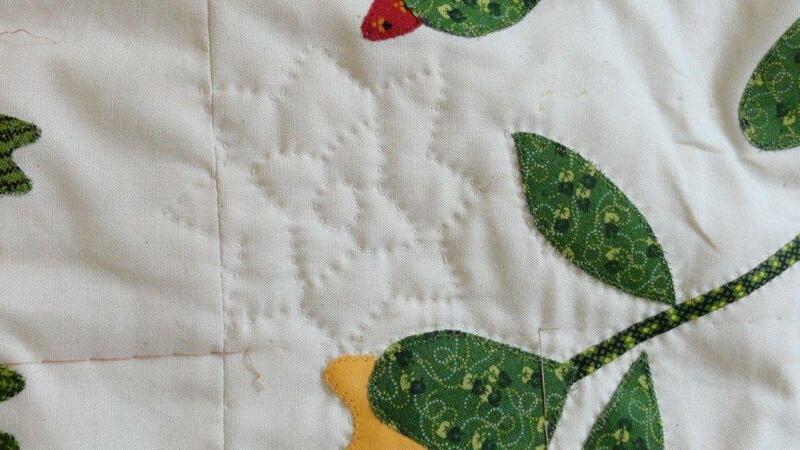 Motifs are quilted and now I'm quilting around the applique. My birthday isn't for 15 days but the celebration starts this weekend! My sister's birthday is one day before mine and so she is coming to help celebrate my BIG number birthday and spend some time together. We plan on taking my mom out for Mother's Day this weekend too. Let's Spend Some Time on the Porch! Clean off your porches and get your chairs out of storage!! Here's our May block. I'm starting early to give everyone enough time to find your book or your partially made blocks. 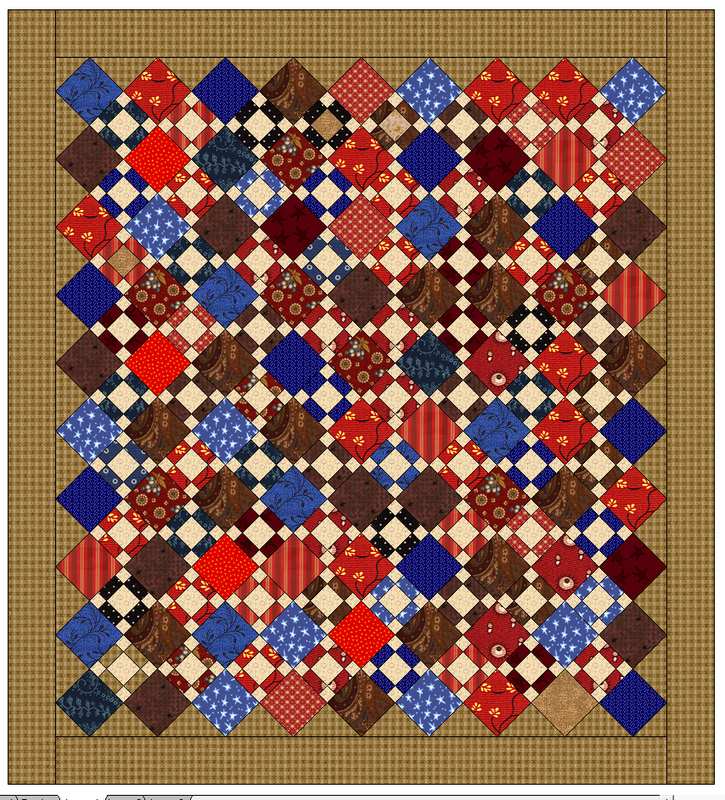 Find a place that you'll put everything pertaining to this quilt. I'm going on vacation this month (May) and several of you won't be able to start right away. That's fine. We'll start slow and make it easy to get caught up. I am hoping to have my block prepped and handy so I can add a few stitches when I have a few moments. I thought I'd post a block at the beginning of the month, then do a link up at the end of the month so we can see each others blocks. 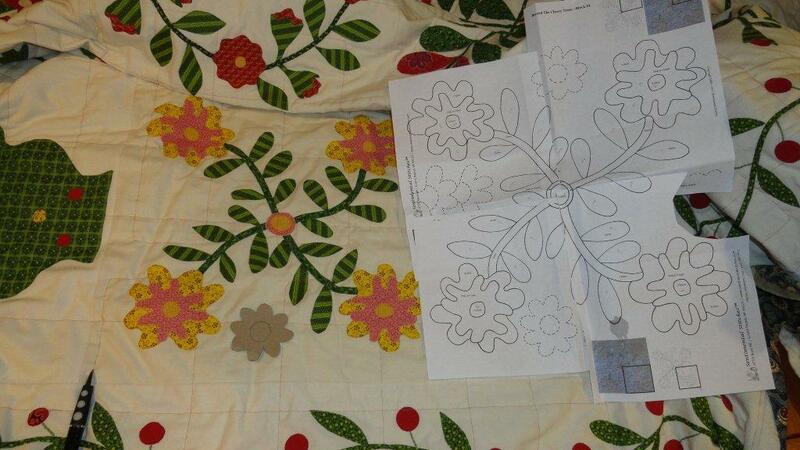 I contemplated doing this quilt in wool, but decided I was ready for a cotton applique project. It was brought to my attention there are corrections in the book that need to be made. I wrote them right in my book this morning. Thanks Dorothy!! I see they are also on Lynda's website. Page 17 – Section C.
then the rectangles on the right and left are the same length before joining to the top square. to the top to make it look like the photo. 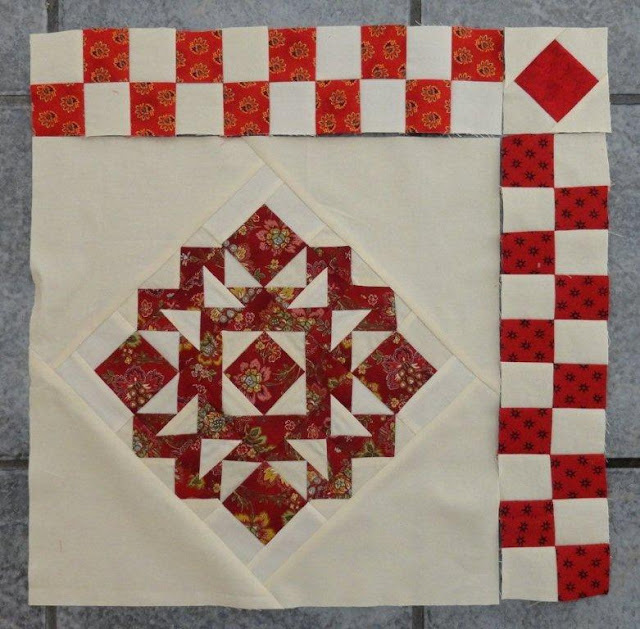 The side squares are an addition to your own liking. The house block with the sawtooth attached should measure 18” x 24”. A Little Porch Time Anyone?? Does anybody else have this book and maybe want to work together on it? I can divide it up and we can do a section a month? Sort of like a Block of the Month? I just figure the accountability will keep me on task. 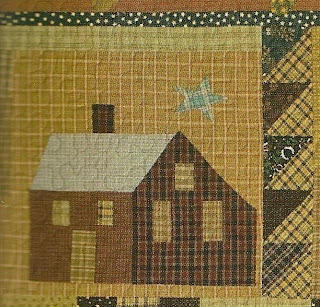 And I plan on making a little porch time this spring and summer and I can't think of a better quilt to work on. 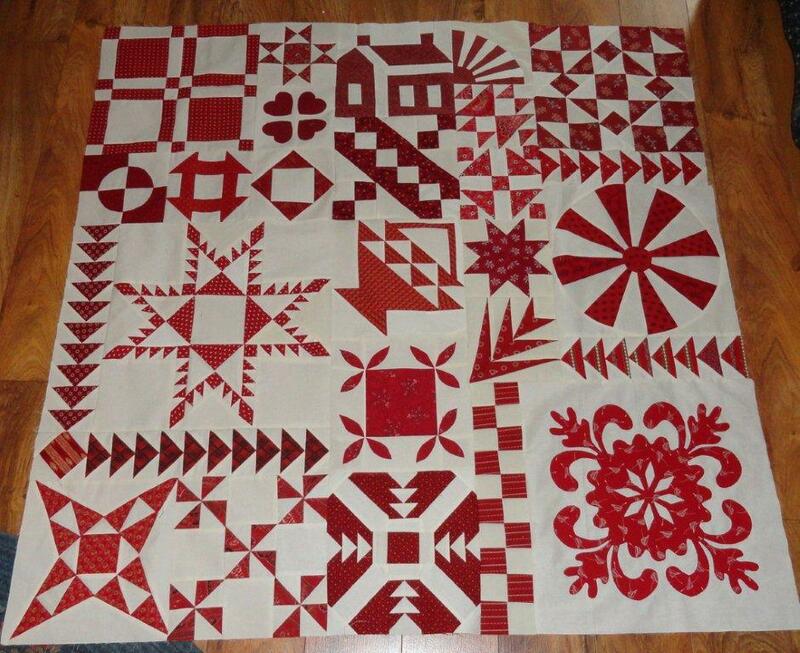 Here's a photo of the quilt I found online. 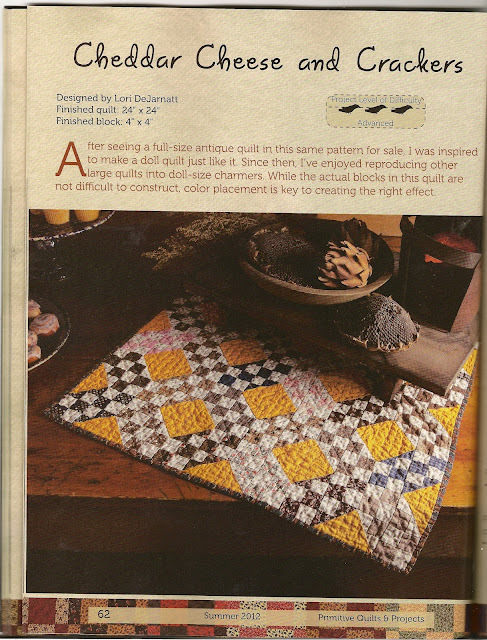 The designer is Lynda Hall at Primitive Pieces by Lynda. Leave me a comment if you'd like to work together this coming year on it. This has been on the design wall waiting for inspiration to strike. I did add the small cheddar border and also decided this block doesn't look good on point. I made another border, this time with spikes to imitate the center points. The only thing I do know, it will not be the next border. I'm strongly considering adding plain muslin and appliqueing a sharp turning vine with flowers??? If you are inspired to show me photos of your ideas I'd love to see them. The next set of Just Takes Two is done! My center block is a wee bit scorched- oops! I like the block a lot. 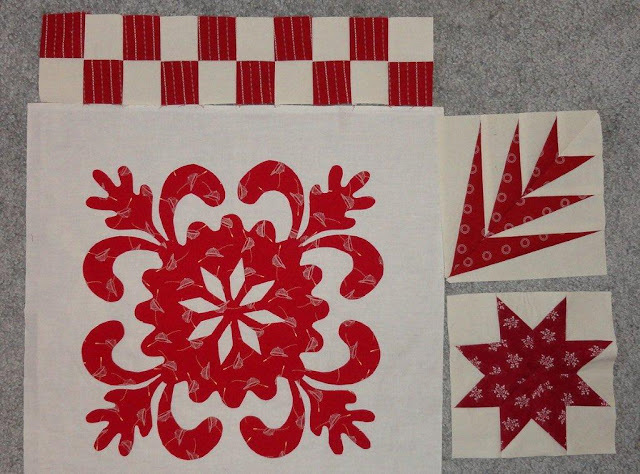 Here's my start on cowboy quilt #2. I miscounted and will probably have enough leftover pieced blocks to make a baby quilt for the next boy that might need a quilt!! 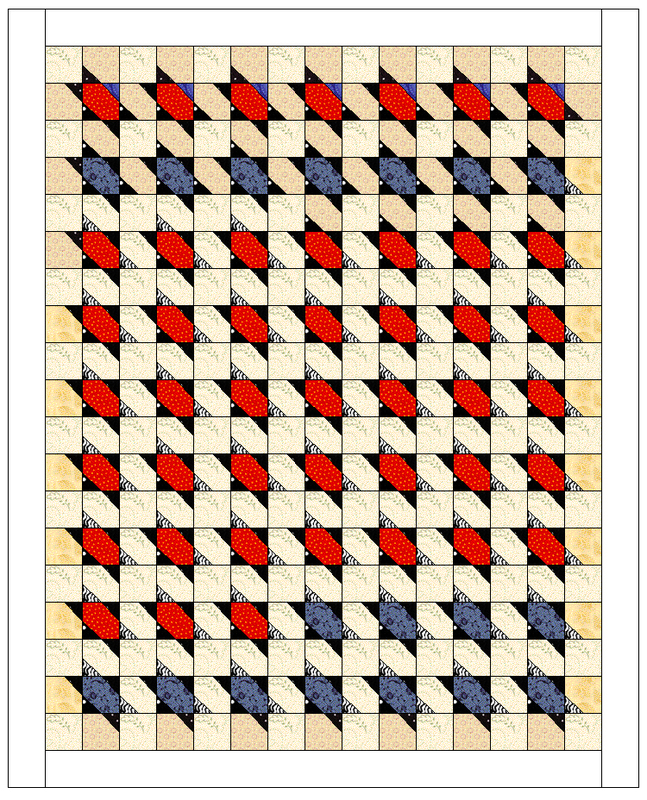 I have to decide if I am going to use a bold red and a softer blue for the setting triangles. We finally have a lovely weather forecast and I plan to be outside this weekend. Enjoy!! I forgot to draw for the magazine winner yesterday so I did it this morning. Sandie- Crazy'bout Quilts is the winner!! Please send me your address and I'll get it in the mail. Thank you to all who stop by my humble blog. I appreciate every single visit and ever comment!! Two blogging buddies are having terrific giveaways right now. I thought I'd post them while ya'll are in the mood to sign up for giveaways. Pam from Library Gal Quilts is celebrating her 250th post!! I met Pam last summer at the Sisters Outdoor Show and she is a jewel. I hope to spend more time with her this summer when she is here. Look at what she is giving away! I have one of her lovely mug rugs. You'll want to get in on this for sure!! Elizabeth is a talented designer who has had her book picked up from numerous LARGE distributors. 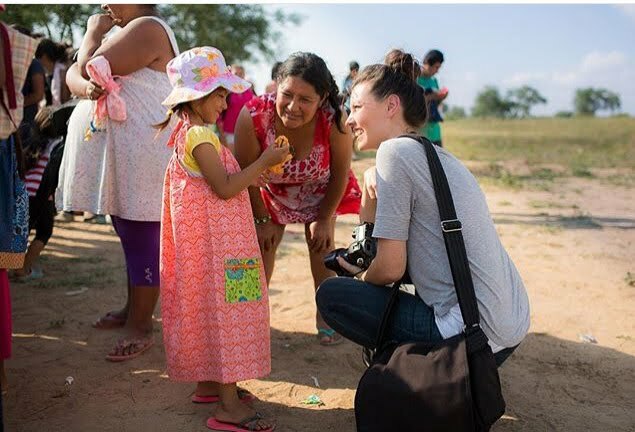 She is giving away a copy of her new book! And if for some reason you are here and haven't signed up for mine, you'd better do it now! Go here. Just Takes Two and Giveaway!! I set my cowboy quilt aside yesterday to get the first quarter of the Just Takes 2 sampler together. I don't want to get too far behind. I am not normally a huge fan of sampler quilts, but this quilt will really be a good reminder of the red and white quilt exhibit in NYC and my memorable vacation with my daughter. I have an extra copy of Primitive Quilts & Projects to give away!! 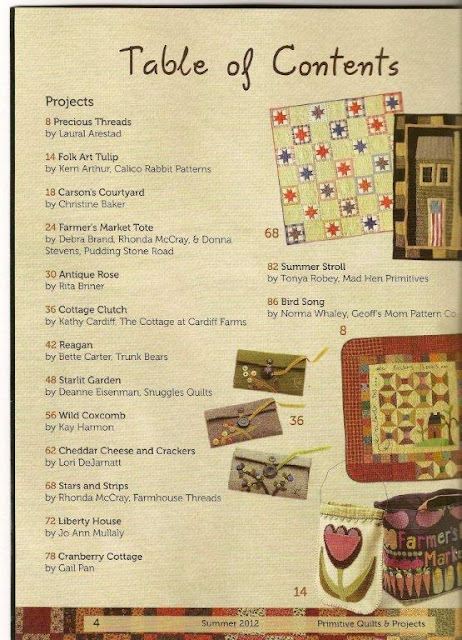 I'm still so excited to have my Cheddar Cheese & Cracker quilt in here alongside some of my favorite designers. Look at these wonderful projects made by these talented designers!! Be a follower and leave a comment to win my extra copy. I'll draw a name on Friday. Good luck!! Cowboys and Cherries Oh my! Here's the first cowboy quilt top. I'm waiting to get the second one done before adding borders. Barb in MI cowboy fabric came today and my friend Jill sent some as well. Thanks ladies!! 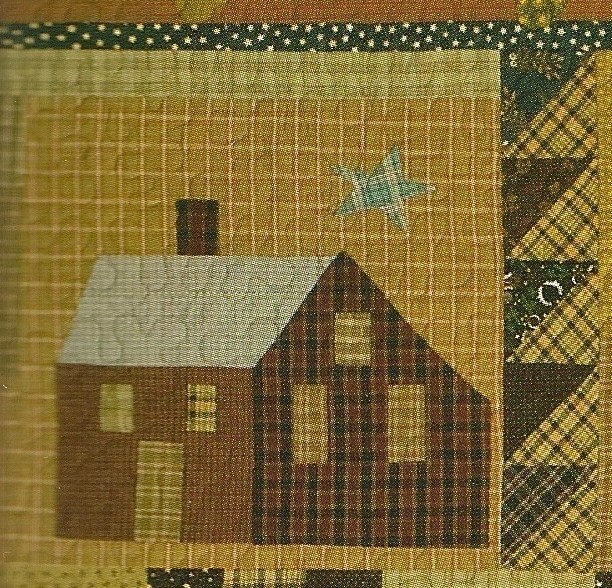 When Gay at Sentimental Stitches made copies of her antique quilt she also copied quilting motifs and added them to the patterns. I've made cardboard templates for one of the blocks and hand quilting has started!! I know I have Danish readers. Here is my sons host brother Jon on duty protecting the Queen of Denmark!! I guess it's ok for me to show this now, since my magazine came in the mail today. Aack! I can't believe it!! Woo-hoo!! 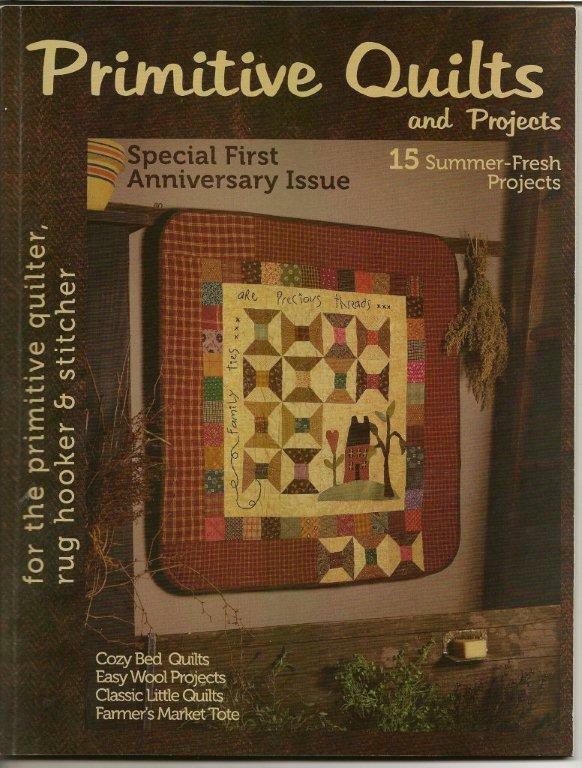 Thanks to Primitive Quilts and Projects- if you don't subscribe, you should. Oh my gosh, there is so much in this issue! I want to make one of each!! I also want to thank Marcie from Patchalot Patterns for encouraging me to submit the quilt to them. I'd love to see a photo if you make the quilt. I am making the cowboy quilt for Ian, but decided that I couldn't make just one. The little girl is almost a step sister. (3 months apart too!) I think she'd like a cowgirl quilt. I'm sewing away...on both of them but for now here's my Electric Quilt mockups. My quilt is way scrappier and you'll have to look hard to see the stars. Here's number 2 quilt. I wanted to keep the pieces fairly big and this one looks like it should do the trick. 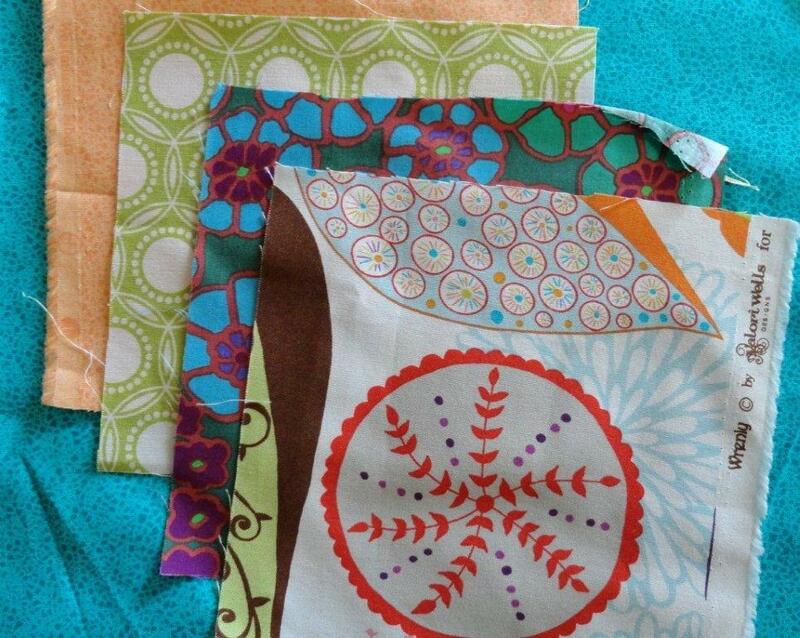 I've received wonderful fabric from Jody S, Marei, Sharon, Annette, Lane and Vivian. Barb from MI sent some but is taking a detour...... Thank you all so much for your generosity!! Here's a funny note explaining how that happened. I think you just won some kind of record! Your quilt was purchased FOUR times! Let me explain. Our website isn't automated. 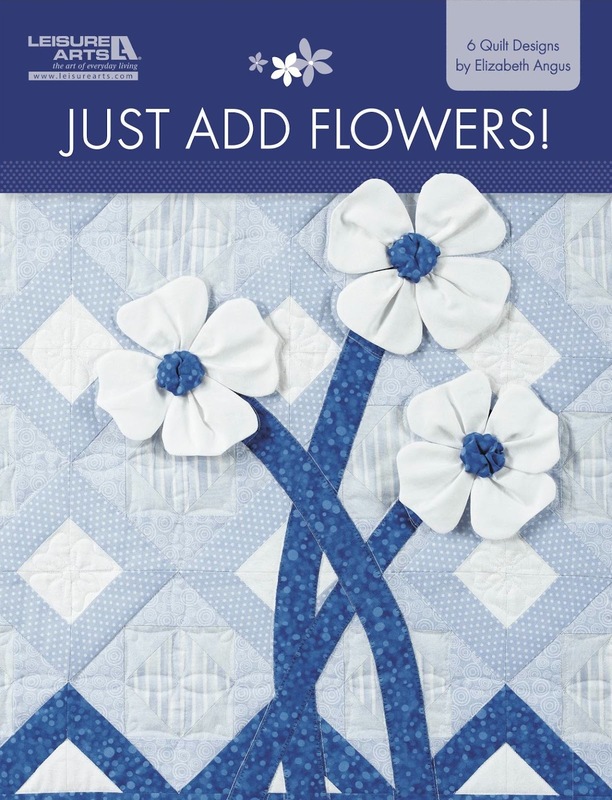 We have to visit the website to pull of orders and when we do we manually take the buy button off (when the quilt is sold or when it is ordered and we put "sale pending"). 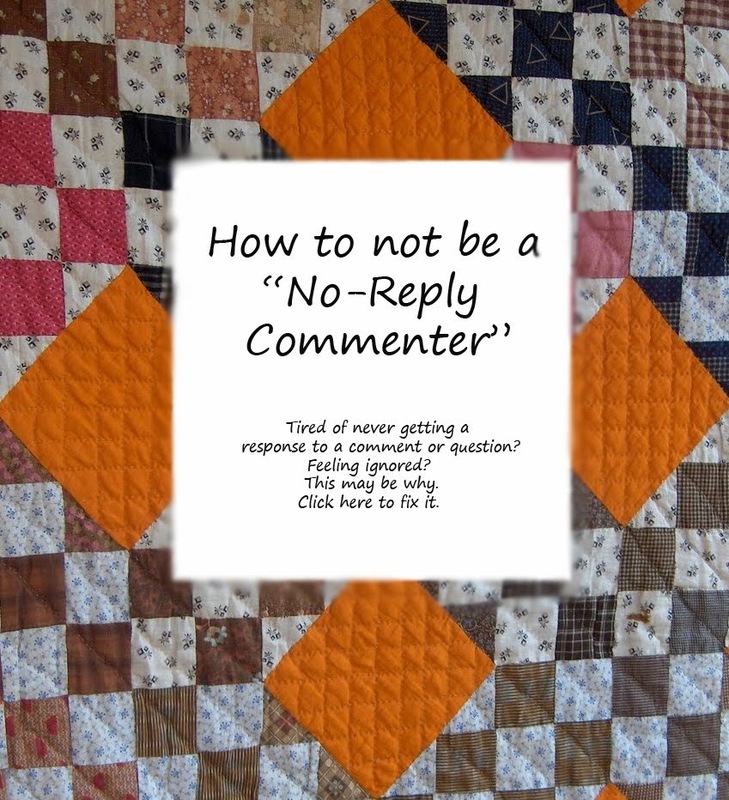 It is possible, tho unlikely, that a second customer can therefore order the quilt before the web page is published. We pulled off the first order and processed it. The order was placed Tuesday. Our volunteer forgot to publish the page to make the changes visible. 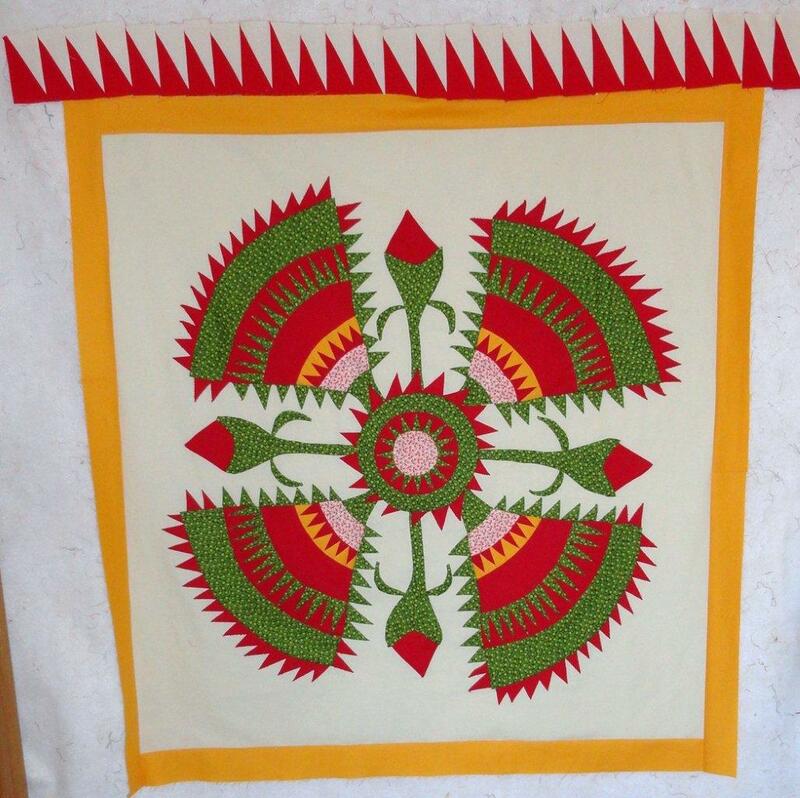 Somehow, later on Tuesday, 3 more people ordered your quilt! Still not sure how that happened and why those orders weren't visible to us when we processed orders today. 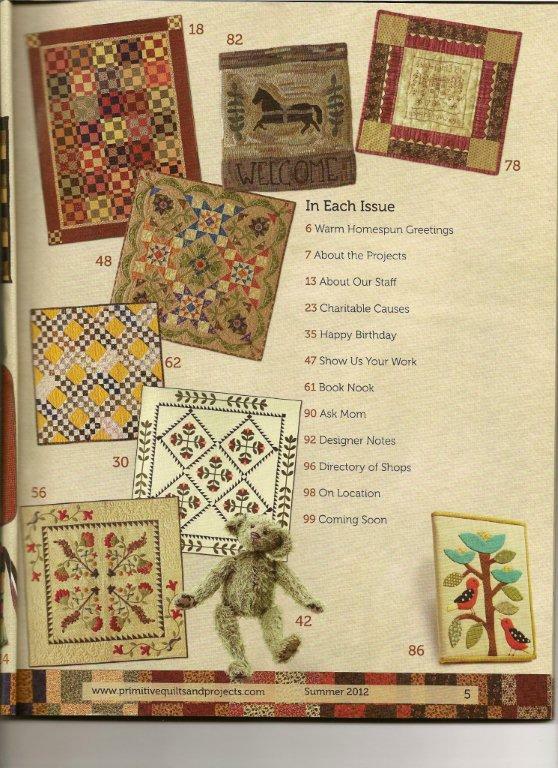 Long story short, does it help to let your readers know that your quilts are available to purchase? ABSOLUTELY! That was the fastest $50 bucks the AAQI made this month! 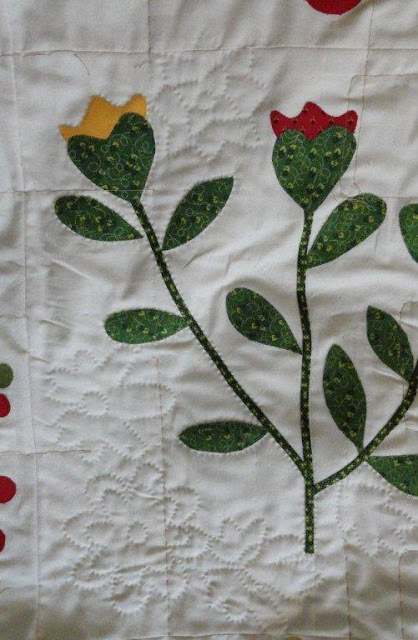 Thank you for making your quilt and for blogging about it! Thank you A LOT!! More than $713,000 raised for Alzheimer's research since January 2006. Help us make a difference...one quilt at a time. 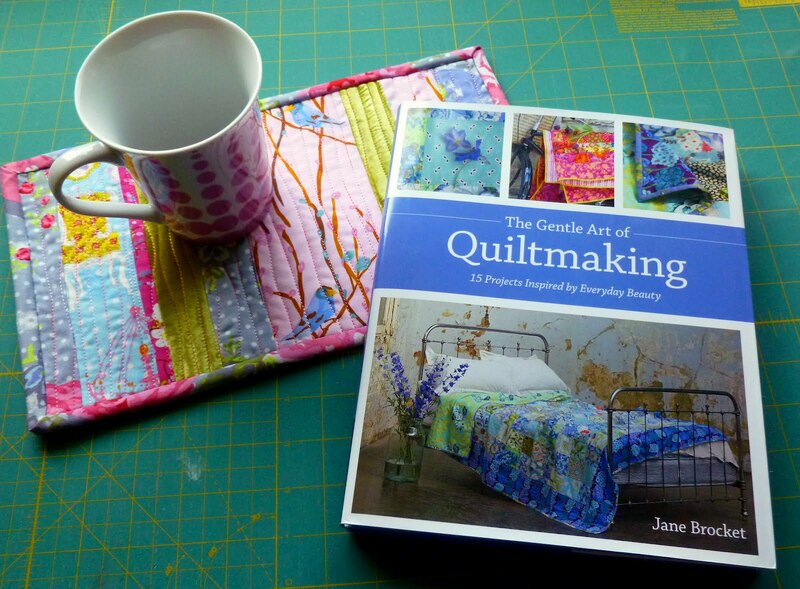 Thank you readers for trying to purchase my quilt! I think this means I need to get busy and make a few more. I sent an email to join to $1000 pledge. It looks like this last quilt sold puts me at $574.67 raised for this wonderful cause. Hit the AAQI link and find another lovely quilt to purchase. You have hundreds to choose from!! No Rhyme or Reason now up for sale! And while you are there you may as well look at this month's auction!! Going on now until April 10th. But please consider purchasing mine first. Thanks a bunch! Here's my start to the cowboy quilt. I'm not one to make a bazillion blocks then sew them together. 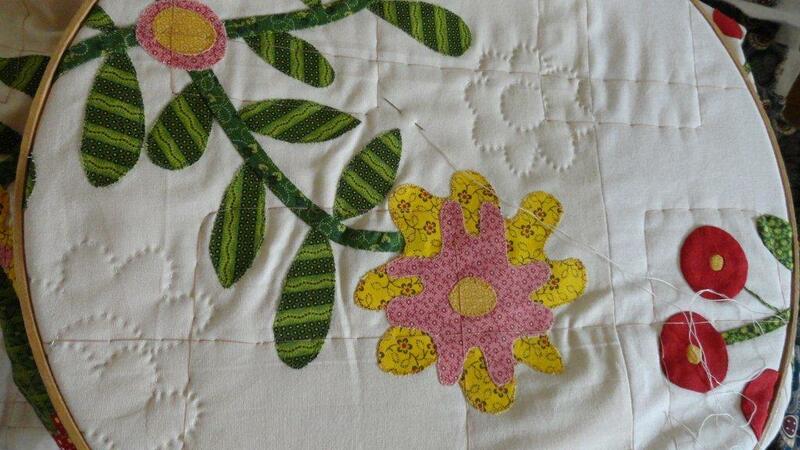 I make a few blocks, sew a few sections together, repeat, repeat....repeat until completed. 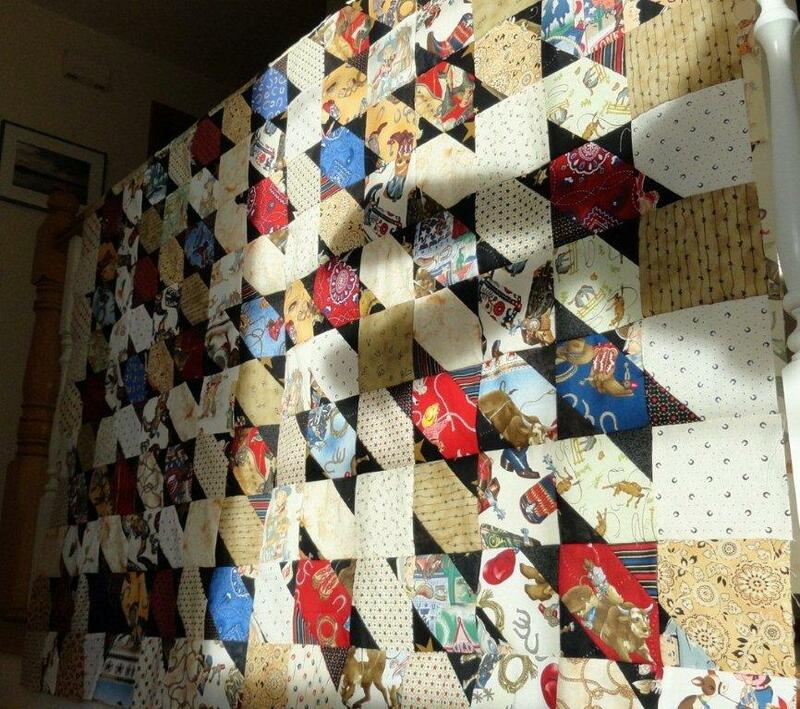 I am going to try and be more focused on this quilt this week. I'm still waiting for a few more packages of cowboy fabrics to come in. BTW, the first two cowboys in my last post are my hubby's great grand uncles who were raised in Montana and moved to Los Angeles and became cowboy actors. The last photo of the man with the guitar is my grandfather who was a cowboy all his life.